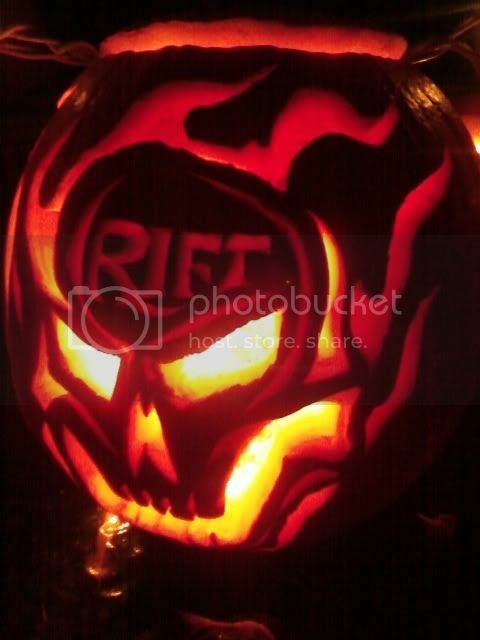 Thread: Rift Halloween Pumpkin Contest! Halloween is fast approaching. So we thought we would have a little fun! We’d like to see some Rift themed pumpkins! 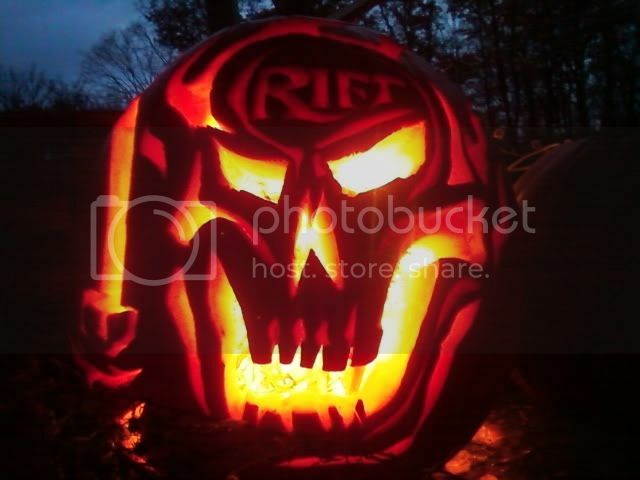 Carve your pumpkin with a design pertaining to Rift in some way. Post a picture of it in this thread and we’ll send you a VIP All Access Beta code! The contest will end at 5 p.m. Pacific Time on Friday, October 29th. So start carving those pumpkins and post your pics! Please help us keep this thread clear of anything but contest entries. We’ll be deleting any posts that are not an entry. Feel free to start another thread if you want to discuss the contest. We look forward to seeing how creative you can be! Oooh, oooh contest! Pumpkins! Goodies! Post a picture of it in this thread and we’ll send you a VIP All Access Beta code! But uh, is everyone who's posting a picture a winner of VIPkey or isit a specific number...? Oops, sorry. Delete this post. Ill make a thread about it instead. What's a pumpkin? Strange foreign delicacy? I added pic to my facebook to make easyer to add did it work? Last edited by Smovy; 10-25-2010 at 09:53 PM. Last edited by MacDeath; 10-25-2010 at 02:02 PM. Last edited by Helvirian; 10-25-2010 at 07:34 PM. Reason: added another angle to get the flames in the shot..
Skeleton from plane of death. Last edited by xxar; 10-25-2010 at 03:01 PM. Wow Xxar, that's a really awesome skeleton... Very detailed. Nice job all so far I always like seeing pumpkin carvings! I will get started and even post a pic proving I actually carved my pumpkin to make sure there is no question it is hand made by me. Last edited by xxar; 10-25-2010 at 03:23 PM. http://www.tagyerit.com/pumpkin/2007.htm <<< scroll down down you will find it ... ... !